Nicole Johnston is our guest for this month's Teaching Spotlight. We have looked forward to working with her Textile and Apparel Management students for the last few years, and we're excited to share her thoughts on object-based teaching. Please tell us a bit about yourself and your interests. I am Collection Manager of the Missouri Historic Costume and Textile Collection in the Department of Textile and Apparel Management (TAM) and also teach a large Writing Intensive lecture class for TAM titled “Survey of the History of Western Dress.” I have completed two degrees from the University of Missouri, during which time I learned that history, material culture and art are three of my favorite interests. 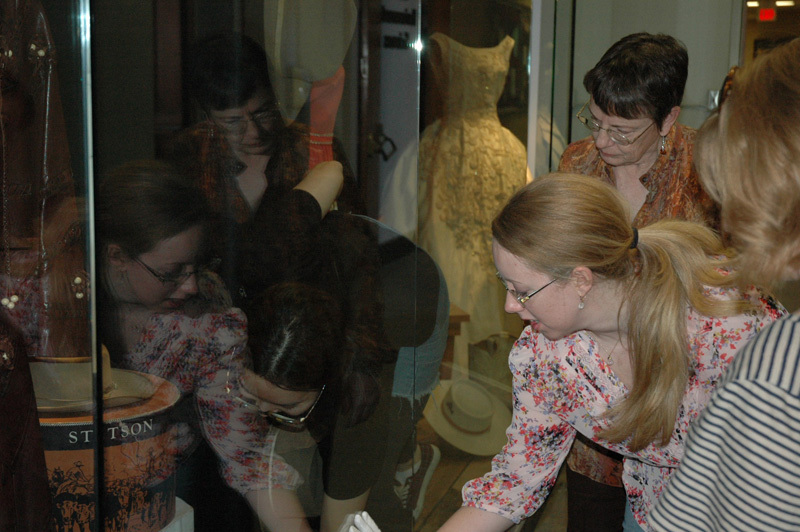 I very much enjoy the hands-on, object-based aspect of material culture and working with the costume collection and in TAM enables me to combine all three of my passions. Teaching, in turn, lets me explore and research these fields in further detail and pass on this knowledge and excitement to my students. Dress, after all, incorporates almost every discipline on the University campus in one way or another, and it’s great to see students make these connections and, in turn, broaden their horizons and stretch their minds. 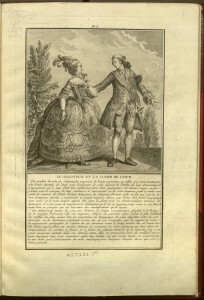 How do you use Special Collections in your teaching? As manager of an historic costume collection, I’m a big believer in object-based teaching and learning, and I try to take advantage of as many visual learning opportunities as I can. There is so much more one can learn about an object and its history through seeing and possibly touching the object up close. The object itself, the process of creating the object, it’s use and meaning, all become so much more real through this process, more personal. That’s why my class visits Special Collections every year. This year, in the process of learning about the development of book making and printing technologies, and their impact on dress, we took a closer look at the Collection’s illuminated manuscripts and incunabula. 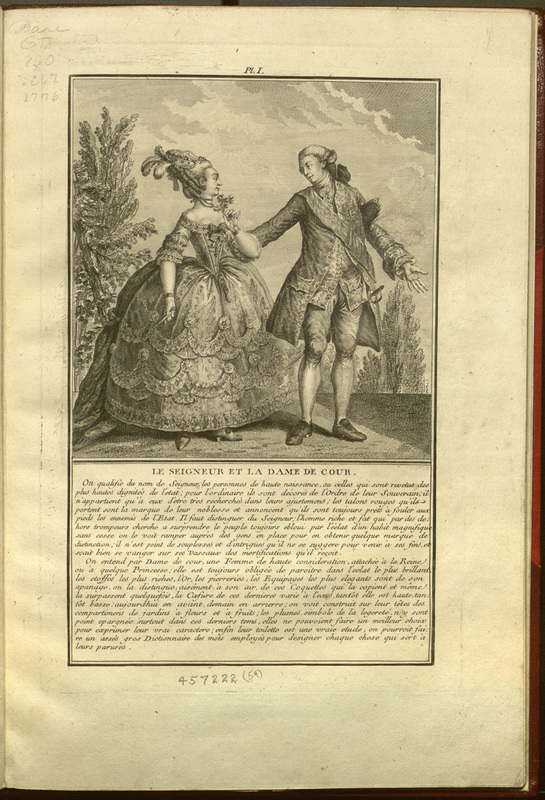 Last year, we looked at the Collection’s primary sources from the 18th century, such as books, journals and fashion magazines, while researching Marie Antoinette, Queen of France, and her social and political uses of dress. What outcomes resulted from your class visits? What were the effects on your students? What advice would you give to faculty or instructors interested in using Special Collections in their courses? Students’ learning experiences are broadened and amplified through the use of objects. Stretching young minds in this manner is a tremendous opportunity that shouldn’t be missed. In the process of discovering and researching history’s rich resources, students learn more about themselves, where they came from and where they’re going, than they ever could without them. The staff at Special Collections will assist in any way they can to create a quality, object-based learning experience for any and all faculty who are interested in incorporating this type of teaching tool into their classroom experience.